Optional tour: 3-hour evening cruise with prawn buffet. Following breakfast you check out from your hotel and walk to the train station (easily accessible by foot), where you board a train that takes you to an unforgettable Oslo - Myrdal - Flamsbana Railway ride. This trip is a perfect chance to admire the mind-boggling nature and picture-postcard sceneries of Norway. Upon arrival you walk to your hotel in Flam and have the rest of the day free. Optional tasting: Beer tasting at the Ægir Brewery & Pub. Optional extension #1: Boat Trip to Balestrand. Today you enjoy an express boat ride to the town of Balestrand nestled in a truly magical setting nearby Norway's largest Sognefjord. Optional extension #2 (available only for those who booked the optional extension #1): Briksdal Glacier Day Trip. Your guide and driver meet you at your hotel in Balestrand and after a 2-hour drive you will arrive to Briksdalsbreen to admire one of the most famous glaciers in Norway. In the afternoon you walk to the pier (easily accessible by foot) to enjoy a 5,5-hour express boat trip to Bergen - the second largest city in Norway. This is a wonderful experience definitely worth trying! Upon arrival you walk to your hotel located very close to the boat station for overnight. Following breakfast you enjoy a 3-hour guided city tour around the most interesting sights of Bergen. During the tour you take a walk at the famous Bryggen district, visit the Fish Market and experience a fantastic Floibanen funicular ride that is one of Norway's best-known attractions. After the tour you have the rest of the day free. In the evening your driver transfers you to the pier to embark the Hurtigruten cruise ship that takes you to the voyage of a lifetime to the magnificent land of fjords. Cabin upgrade with ocean or land/fjord view - 300 USD per cabin. Today your vessel arrives in the beautiful Art Nouveau town of Alesund. After a short stop you continue cruising by picturesque 800-meter high cliffs and impressive waterfalls to the spectacular UNESCO-listed Geirangerfjord that is one of the most visited tourist attractions in Norway. Note: There are no tours included in the cruise program from this day on, but optionals are available. You are free to book any of them to combine your cruise experience with professional sightseeing tours. Please, contact your travel specialist for additional details. Note: Hurtigruten makes stop in Geiranger from June 2 to September 1. From September 2 to November 1 it is replaced with Hjørundfjord. From November 2 to June 1 fjords are not included in route. Today your cruise vessel arrives in the first capital of Norway - an ancient city of Trondheim. You have some free time to explore the unique Viking heritage of this amazing city. We recommend you to take a walk around the cozy narrow streets of Trondheim, enjoy the scenic views of the harbor and discover the most cherished treasures of the old town, including the restored wooden buildings and the fantastic Nidaros Cathedral. Today you experience one of the highlights of your journey, as your cruise ship crosses the Arctic Circle that marks the latitude at which the sun can remain continuously above or below the horizon for 24 hours during the summer and winter solstice. In the evening you reach Svolvaer - the picturesque capital of the Lofoten Islands. These islands are famous for their tiny fishing villages, unmatched Bohemian atmosphere and breathtaking natural attractions, including majestic granite cliffs and white sandy beaches. During the night your ship passes the picturesque Trollfjord and sails through the spectacular and narrow Raftsund strait. This leg of the route presents you with the unforgettable views of the rugged mountainous landscape jutting up against the horizon under the endless sun. Later you reach the Gateway to the Arctic - the amazing city of Tromsø. Take advantage of its beautiful surroundings and numerous restaurants and cafés to relax and spend time at your leisure. Today after brief early stops in Hammerfest and Havøysund you arrive in Honningsvåg - the capital of the North Cape that is the northernmost point of mainland Europe. Spend the rest of the day at your leisure or join one of the unique optional tours. Today your ship reaches the final destination of your voyage - Kirkenes that is a small town situated just a few kilometers from the Russian border and the Sami communities of Northern Scandinavia. In Kirkenes you disembark the ship and your driver transfers you to the airport for a flight to Oslo. 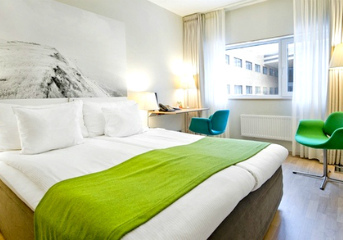 Upon arrival to Oslo you are transferred to your centrally located hotel. This is the last day of your amazing Norwegian adventure! After breakfast you check out from your hotel and your driver transfers you to the airport for your flight back home. We wish you a safe flight and hope to work on your future trips! Not included: international flights, optional tours and services, all personal expenses.